Alfie Potter is a doubt for the Cobblers’ Sky Bet League Two clash with Barnet at Sixfields on Saturday due to a rib injury. The former Oxford United man is set to miss out against the Bees, and that could open the door for a first start of the season for Ricky Holmes against one of his former clubs. 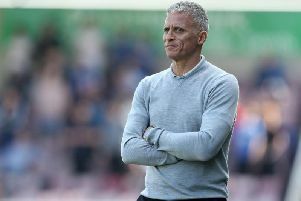 Cobblers boss Chris Wilder suggested after Monday’s 1-0 win over Accrington Stanley that he may make changes to the starting line up for the visit of Martin Allen’s men. Speaking on Thursday Wilder reiterated that and suggested Holmes, Dominic Calvert-Lewin and Sam Hoskins are all in the frame for a start. Asked if there were any injury doubts for the Barnet game, the Cobblers boss said: “Alfie Potter has a little niggle in his rib cage, and there are a couple where we might freshen it up, but there is nothing major that I should imagine will keep anybody out of the team for a long time. If Holmes is recalled, it will be his first start since the final game of last season against Wycombe Wanderers. Ironically, he was named in the starting line-up to take on Barnet back on August 18, but suffered a back inury in the warm-up and didn’t regain full fitness until the end of November. Wilder also revealed that the players currently on the sidelines are pestering him through the week, trying to get themselves noticed and into the team, and that is exactly how he likes it. “Jason Taylor has been his usual self, knocking on my door every day, which is great,” said Wilder. “I love that, I love the attitude of that. “I don’t want players just to be happy sat on the bench and being bit-part players. “It is difficult because the team have gone exceptionally well, and players have to understand that, but I want players that want to force themselves into the team. “Monday to Friday is really important part of the week, and the players need to do what they need to do to say ‘I am here, and I am ready’.